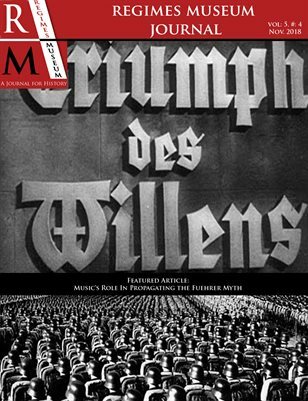 Volume 5, Issue 4 of the Regimes Museum Journal features a detailed article about the Fuehrer Myth propagated by the music used in the Film Triumph of the Will. It is the featured article by a musicologist who studies how music is used by dictatorial regimes to control and influence their citizens and those abroad. Also in this issue is a review of Ralph Pickard's three volume masterpiece on Stasi regalia called Stasi Decorations and Memorabilia. This compendium is a vital resource for scholars, students, and collectors interested in understanding the material culture of the secretive Stasi, known mainly as the MfS.